GALION — A College Credit Plus informational meeting is planned Wednesday, Jan. 30 at Galion High School, at 6:30 p.m. in the cafetorium. If classes are canceled Jan. 30, the meeting will be at 6:30 p.m. time Wednesday, Feb. 6. 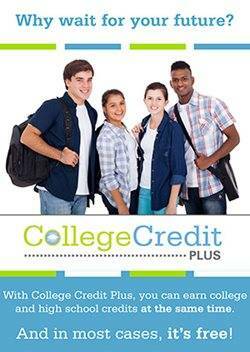 This program gives students the opportunity to earn college credit before high school graduation. Tuition, fees, and cost of books are provided at no cost to parent if the course is successfully completed. Students currently enrolled in grades 6-11 interested in pursuing CCP classes for next school year, and their parents, are encouraged to attend. The meeting is the first step required in the application process and receiving the information from this meeting is a mandatory part of the process. The meeting will give a general overview of College Credit Plus, the qualifications, the application process, procedures, and important deadlines and be presented by counselors from the Galion High School, The Ohio State University-Mansfield and North Central State College. At the meeting, students and parents will sign an “Intent to Participate” form to keep the option open for the next school year as they work through the application process. Students presently enrolled in the program and plan to continue during the 2019-2020 school year do not need to attend the meeting. However, a “College Credit Plus Intent to Continue Participation” form must be submitted to the Guidance Office no later than April 1. These forms will be made available during the GHS scheduling process. For information, call Tena Eyster or Amy Cline at 419-468-6500, or Amanda Watkins at 419-468-3134.